Here are some example pictures and technical descriptions of GTE / Automatic Electric Pay Phones that are still commonly found in the USA and Canada. 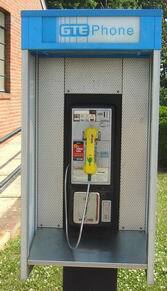 This is an example of a model 120B GTE / Automatic Electric "Fortress" pay phone. It is similar in design in many respects to the Western Electric/ Lucent Fortress pay phone. Click on the picture to the left for a close-up of the phone. Production on this phone started in the 1970s by AE and was later maintained by AE's successor, AG Communications (joint venture of AT&T and GTE - now part of Lucent). These phones are no longer being manufactured. I do not know if Lucent is performing any maintenance on these or not. These phones are found extensively in the former GTE telephone (now part of Verizon) territory and are also found in many independent telephone systems as well. They are also found somewhat in Canada in British Columbia (former BCTel, now TELUS). Notice the coin slot and coin return slots are on the right instead of on the left as on the Western Electric / Lucent Fortress. Most of these pay phones are Central Office controlled (including ACTS compatibility). However some modern versions are either made from the factory to be COCOTs or have been modified to be a COCOT. This is an example of a COCOT in a GTE / Automatic Electric housing. Left - First generation with rectangular buttons. Center - Second generation, rectangular buttons with diagonal letters. Right - Third generation with square buttons and amplification button. There were both rotary dial and Touch-Tone versions of these phones. Touch-Tone keypads have several versions depending on the vintage of the phone. Older phones have recessed rectangular metal keys (left and center pictures). Newer ones are regular square keys and made of metal. I've seen a few with white square plastic keys. Almost all of the cases are painted black, but in one rare case, I've saw one painted pink!